In 2002, Linda Stowe founded a website and an email list called Dodgerslist as a central place to share information with dog owners. It was named in honor of a dog named Dodger who was possibly euthanized prematurely because the owners and vets were not educated on all the available treatments. The website today is now a premier educational website. Information culled from the foremost veterinarians successful in treating this disease is made available to the public via the website. Dodgerslist is an all-volunteer organization of five moderators bringing experienced talents who contribute to writing, website development, and design of all educational materials including a quarterly newsletter. Each has years of personal experience with IVDD dogs plus big hearts and patience to help panicked owners with questions on the forum at dodgerslist.boards.net The forum, also called Dodgerslist, provides phenomenal emotional support to cope with the disease plus at-home-care information to make sure each dog has the very best opportunity to heal. After a few weeks, many owners lose all hope that their dogs will walk again and euthanize their pets unnecessarily based on their own interpretation of how a dog perceives ambulation. 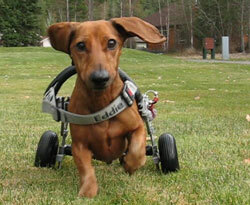 Dogs are not embarrassed or depressed by paralysis. They do live happy, normal, fulfilling lives with the assistance of a wheelchair if necessary and a loving owner until such time as neuro functions might return. Dodgerslist works tirelessly to educate on the forum, the web page, and by providing veterinary professionals with their DVD and brochures. Today, Dodgerslist consists of over 6000 members on our forum and over 20,000 on our Facebook page, from Dachshund lovers, breeders, DVMs, and owners of other breeds who have disc disease. Dodgerslist is also on Twitter, Instagram and Pinterest. 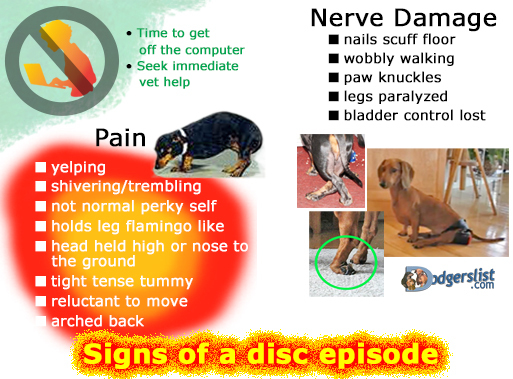 Dodgerslist Disc Disease DVD features a medical segment by Dr. Mark Lawson, DVM, of Alpine Animal Hospital along with how to live with and care for an IVDD dog. Groups and veterinary hospitals use this DVD for educational purposes for clients, members, and staff.